The show will bring back successful Sam Houston graduates to share the stage with current students as they put SHSU’s performing arts programs in the spotlight, on center stage, in the 800-seat concert hall of the James and Nancy Gaertner Performing Arts Center, according to Dana Nicolay, dance professor and interim dean of the College of Fine Arts and Mass Communications. Among the returning alumni are Eboni Adams, a 1999 dance graduate, who is now making a name for herself as a choreographer after dancing in musical productions for Celine Dion and Tony Bennett; and award-winning composer and producer Gary Powell, a 1974 music graduate with more than 125 musical productions, many from well-loved Disney blockbusters. 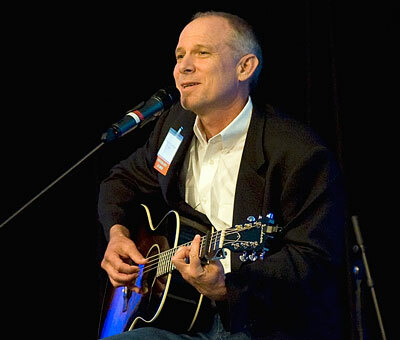 Also on the lineup is Allen Shamblin, a business administration graduate and award-winning songwriter, whose song “The House That Built Me,” recently won the Country Music Association’s song of the year. Shamblin said any time you’ve been blessed, you should give back. Shamblin will not be returning to Huntsville alone. When told he could fill his time in ENCORE any way he chose, he called on buddies Mark Wills and Mike Reid, who have each recorded several songs that have reached No. 1 on the country music charts. The trio will perform songs separately and together as they fill one set of the show. “The show will transition from people to people who are going to not only perform but share stories of what they’ve been doing since the time they graduated from Sam,” said Larry Smiglewski, assistant professor of theatre and director of ENCORE. Scotty Cherryholmes, a graduate of the theatre department and a 2010 recipient of the SHSU theatre alumni award, will emcee the show, which is expected to last about two hours with an intermission. “Just when you think the show is over, he’ll bring out another act,” said Smiglewski. “It really will be a celebration of our alumni. As many as 20 current students who are studying music, dance or theater will participate in the show as well, showcasing all three of the performing arts disciplines. While Nicolay and Smiglewski are confident ENCORE will help spotlight the new state-of-the-art facilities at Sam Houston and draw patrons to future shows, they hope the alumni who bring ENCORE to life will draw talented students to the university as well. The new performing arts venue has hosted several major performances in its first season that have been “well attended,” but the new College of Fine Arts and Mass Communications is hoping ENCORE packs a full house, as the event will raise money to help fund various projects within the new college and provide scholarships to talented students, Nicolay said. One night of fundraising, however, is not the only purpose of the event, according to Nicolay. He hopes Sam Houston will continue reaping the benefits of ENCORE in the future. Tickets are $75 and can be reserved by calling the PAC Box Office at 936.294.2339 or e-mailing encore@shsu.edu.